We are a small privately run restaurant in the centre of the Peak District's main town of Buxton. 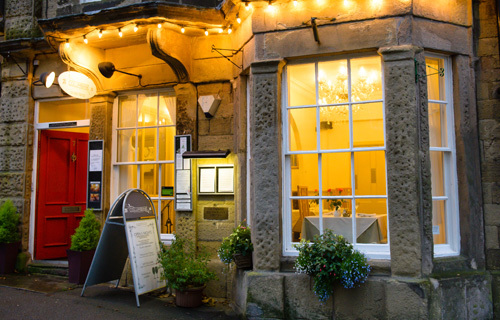 The Columbine Restaurant is situated in the heart of the beautiful spa town of Buxton, surrounded by Derbyshire's Peak District. It is within walking distance of the magnificent Buxton Opera House, and the new Buxton cinema, making it ideal for a perfectly timed pre show supper, or a relaxing evening meal with friends, family or colleagues. Steve and Kim McNally have run the restaurant since 1997 (after spending many years in guided restaurants and Country House Hotels). Our aim is to use small local suppliers in the Peak Distict, who can provide us with first class produce which we serve in a variety of dishes from the à la carte menu, vegetarian and specials choices. 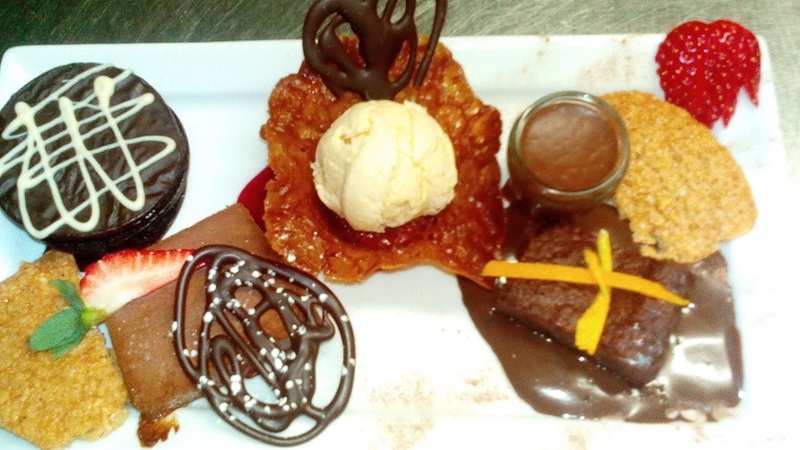 During the Christmas and festival seasons (July and August) our menus are added to with a set price table d'hôte menu. Pre and after theatre suppers available all year by prior reservation. The restaurant comprises of three rooms over two floors (one on the ground floor and two in the cosy cellar), each is spacious enough to allow privacy without losing the relaxed, snug feel of an intimate restaurant. The three spaces are also available for you and your friends, family or work colleagues to use privately (from 8 to 18 guests). We source as many of our ingredients as locally as possible so that we can vouch for the provenance of our dishes:- local butchers, growers etc. All our dishes are freshly prepared and cooked, enabling Columbine to cater for diners with allergies and intolerances. We open earlier for pre theatre suppers by prior reservation. Late bookings/theatre suppers (after 9pm ) require prior reservation. Please note we will be closed on Wednsday 17th April. We offer Gift Vouchers at the Columbine Restaurant, personalised to your requirements, Christmas, Weddings, Birthdays, Thank-Yous , for any value. For this we do require you to telephone the restaurant directly- or email your details-but NOT your credit card details. Please use this form for any queries you may have regarding your proposed reservation e.g. largest size of table, accessibility, special diets or any other question you may have. The Columbine always replies to enquiries and bookings (even if we can't accommodate your request) please add us to your address book or contacts, If you do not appear to have a reply within 24 hours please check your junk or spam folder for our reply. The information requested eg, email address and telephone number is so we can contact you as to the availabilty of your request. We need your consent for us to keep your details so that we can contact you back. Thank you for a fantastic meal last night. 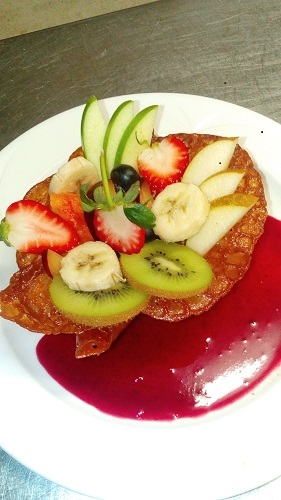 The quality of the food and the service were excellent. A very memorable evening. Dear Kim, Steve et al. Thank you for two lovely meals in the last few days. The boys and girlfriends enjoyed Saturday, and the B… and A… equally enjoyed this evening. Thank you for helping to make my 65th celebrations so enjoyable, and thank you for the cake - it really meant a lot that you had gone to the trouble to do it. We look forward to all our future visits. All the best. Thank you for looking after us on Sunday. We all had a lovely time. Hope we weren't too loud. Hoping that we can be with you again soon. Hi Kim, I just wanted to write a short note to thank you and your team for Saturday night - the food and service were perfect, and all made sure that everyone felt comfortable and in no need to rush their food. I'm very much hoping I don't have to organise anything similar, but we'll be certain to recommend you to our audiences, and I'll look no further if ever we have to treat anyone in Buxton in the future! Thank you so much for the excellent dinner on Saturday and for all your hard work. We could see that the relatively short time-frame was quite stressful for you but in the event, everything worked like a well-oiled machine. Thanks also to your lovely staff who managed to keep smiling while rushing around serving us all. Here’s to our next Buxton event and the inevitable accompanying Columbine dinner! We have recently returned from a trip in N England. Just a note to thank you for the excellent ambience of your restaurant, the very fine standard of your cuisine and the way in which you provide it. Outstanding. We will certainly visit you again when we trek north. From the Which? Travel Magazine March 2016. 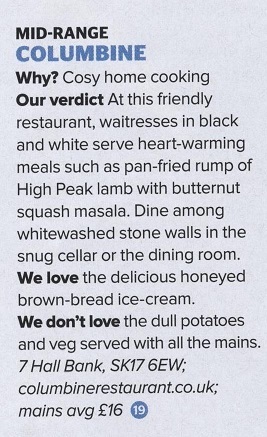 Delighted to be included but don't agree with the dull potatoes comment!- saute have been everyones favourite, from the choices we've served over the years.